La Sardane is a luxury camping site located in the popular Languedoc-Roussillon region in the south of France. Family-friendly and only 200m away from the sandy beach of Argelès, La Sardane is one of Europe's most appealing campsites. It boasts a plethora of activities, excursions and top quality facilities whilst remaining peaceful and relaxing. Book now with LUX-camp and find some unmissable deals. Why camp at Camping La Sardane? Choose to stay in the luxury accommodation here, fully equipped with all of the necessary modern conveniences and providing campers with unbeatable comfort. Opt for one of the campsites stylish and spacious mobile homes. Complete with a kitchenette boasting everything required to cater for the entire family during your stay, the accommodations on offer are all well-shaded and surrounded by nature. Regardless of the accommodation you choose, you can rest assured that you will have the camping holiday of a lifetime. With so much to do, this luxurious campsite has something to offer everyone. 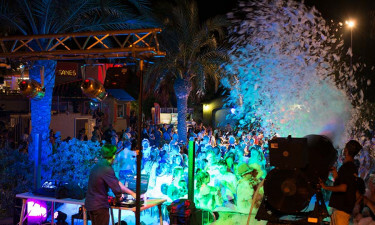 From children’s playgrounds and seasonal entertainment for both young children and teenagers including sports competitions and tournaments to evening cabaret shows, quizzes and bingo sessions, even if relaxation is your ultimate desire, you will never run out of fun-packed activities to enjoy. Sports facilities include tennis, table tennis, mini-golf, volleyball and football, making this campsite a place where the children can be kept entertained at all times. As for the adults, there is a fantastic well-being centre within the grounds featuring a gymnasium and a hairdressing salon, offering a range of beauty and massage treatments. It is also a very dog-friendly campsite and has a dog lawn and showers for your canine friends. 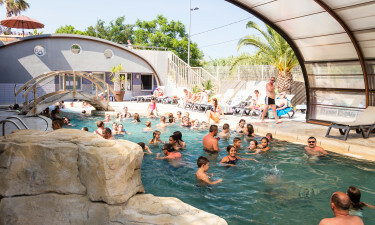 La Sardane is one of the best campsites in Europe for aquatic facilities. This luxury camping resort has an indoor heated pool along with outdoor pools that feature waterslides and paddling pools for the toddlers. Surrounded by deckchairs and palm trees, it is the perfect environment in which to kick back and relax whilst watching the children splash around. 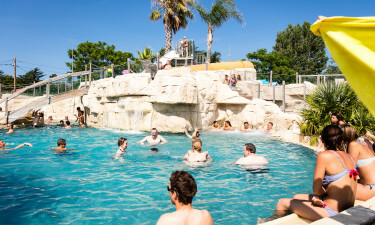 With geysers, waterfalls, aquagym sessions, a jacuzzi, and a fun programme of water activities for everyone to enjoy, the swimming pools are the focal point of this wonderful campsite. Furthermore, with the beach only 200m away, campers can enjoy swimming in the sea or even testing out their surfing or diving skills. There is an on-site restaurant with a wonderfully tempting menu of local dishes as well as fresh fish and wine. 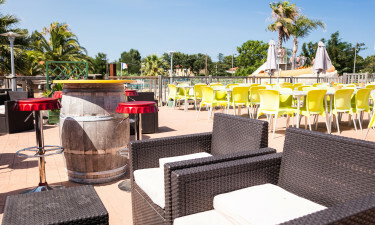 There is also a well-stocked piano bar and other eateries including a pizzeria that offers a takeaway service. Delicious fresh bread is available on the campsite and there is a small but adequate grocery shop selling camping necessities, fresh fruit and vegetables and both local and international newspapers. There is also a gift shop on-site.